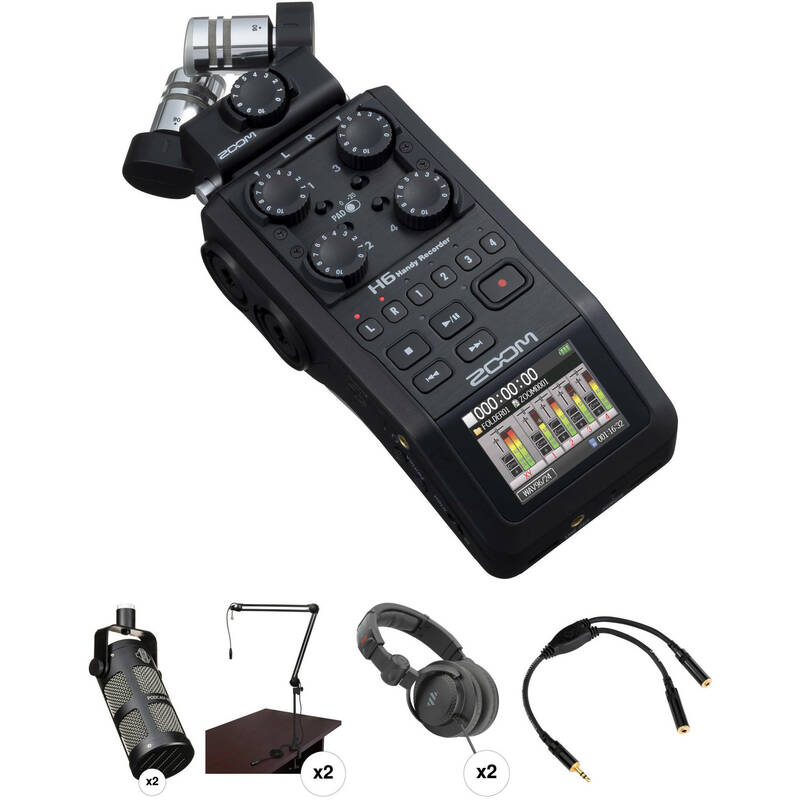 This Zoom H6 Recorder Podcast Kit with Two MXL BCD-1 Broadcast Microphones from B&H brings the elements necessary to begin recording a 2-person podcast within minutes of opening the box. The MXL BCD-1 dynamic microphone features a cardioid pickup pattern that does a great job capturing speakers near the mic without picking up unwanted sounds further away. The included Auray two-section broadcast arms make positioning the mics a snap. The arms' integrated XLR cables plug right into the H6 recorder, which features high-quality mic preamps and records to an SD card. Two pairs of Polsen HPC-A30 around-ear headphones are included to provide monitoring in comfort for both the host and the guest. The midnight purple BCBD-1 Live Broadcast Dynamic Microphone from MXL is an end address, professional microphone with a cardioid polar pattern that is designed for radio broadcasts, voice overs, podcasts, announcers, and more. It delivers a warm, rich tone making vocals stand out in any performance or recording. The BCD-1 features a built-in shockmount that prevents unwanted noise and vibration. The flexible BCD-1 includes a windscreen and a swivel mount that allows for perfect positioning on any mic stand. The Auray BAE-2X is a sturdy two-section broadcast arm with external springs. It's a versatile and practical accessory for professional and home studios, and is ideal for broadcasts, voiceovers or podcasts. The arm features an integrated 15' XLR cable. The BAE-2X is designed with a wide range of motion for precise microphone placement and minimal noise when repositioning the microphone. The external balance-spring design is precision-engineered to support microphones of up to 3.6 lb (1.6kg), and hold them in place. This broadcast arm features a standard 5/8"-27 microphone stud mount that's compatible with most shockmounts and microphone clips. The angle of the stud mount can be adjusted and secured with the locking knob, and the angle is maintained when repositioning the arm - eliminating the need to readjust it every time the arm is moved. The heavy-duty combo mount, consisting of a sturdy C-clamp and a heavy metal desktop mount, offers options for fastening the broadcast arm onto a desktop or permanent installation with the included mounting screws. The 14-inch riser is included to add height to the arm so that it extends over computer or studio monitors. The BAE-2X is a durable and reliable accessory for any studio or recording setup that provides secure support for your microphone along with excellent signal transfer, and won't disrupt your audio when being repositioned. Box Dimensions (LxWxH) 11.8 x 7.55 x 3.85"
Box Dimensions (LxWxH) 23.5 x 7.5 x 3.2"
H6 Recorder Podcast Kit with Two MXL BCD-1 Broadcast Microphones is rated 4.8 out of 5 by 285.